Erin Nelson, AOC Communications and Congressional Relations staff, ventures outside the U.S. Capitol to explore the other buildings under the AOC's care. The Architect of the Capitol is responsible for managing all of the buildings and grounds on Capitol Hill, but we also maintain several facilities across the National Capital Region, including several off-site facilities in Fort Meade, Maryland. I recently had the chance to visit Fort Meade and view the unique collections that are housed there. At Fort Meade, sitting on the 100-acre lot, are 35 structures including the Library of Congress Book Storage Facility, a large working warehouse used by the AOC Construction Division, and 17 World War II-era warehouses. Several AOC jurisdictions use the 72-year-old warehouses to store items here. The Torch of Knowledge once sat atop the Thomas Jefferson Building and now resides at Fort Meade. The items stored in the warehouses are as varied as the AOC jurisdictions to which they belong. The eclectic mix of items is noticeable from the moment you walk in. Statues, displays and boxes fill the rooms, making it hard to focus on any one thing. 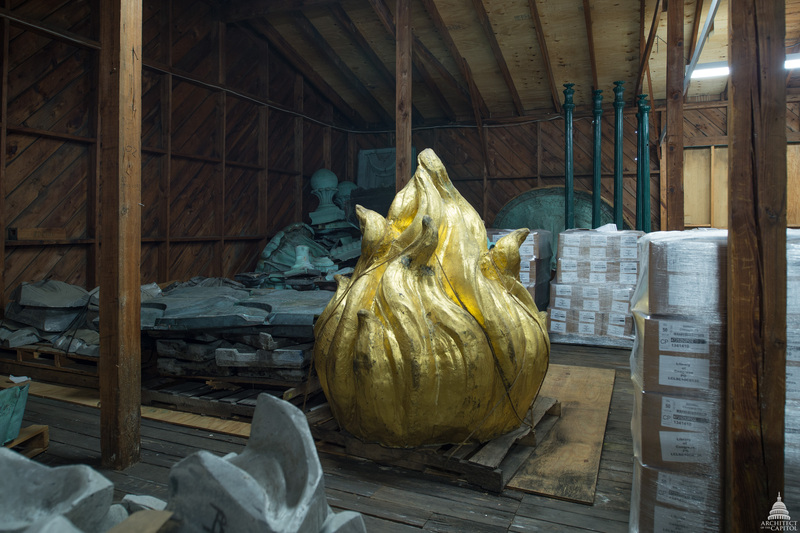 The Torch of Knowledge, the flame that once sat atop the Thomas Jefferson Building, now shares a home with a sculpture that was removed from the Capitol's East Front when it was extended in 1958. The U.S. Botanic Garden's Frosty the Snowman lives here during the summer, as does other seasonal equipment used to care for the buildings and grounds on Capitol Hill. Among the larger items sit boxes, neatly stacked, numbered and organized in rows, much like the items in the Library of Congress Book Storage Facility, which sits nearby the warehouses. 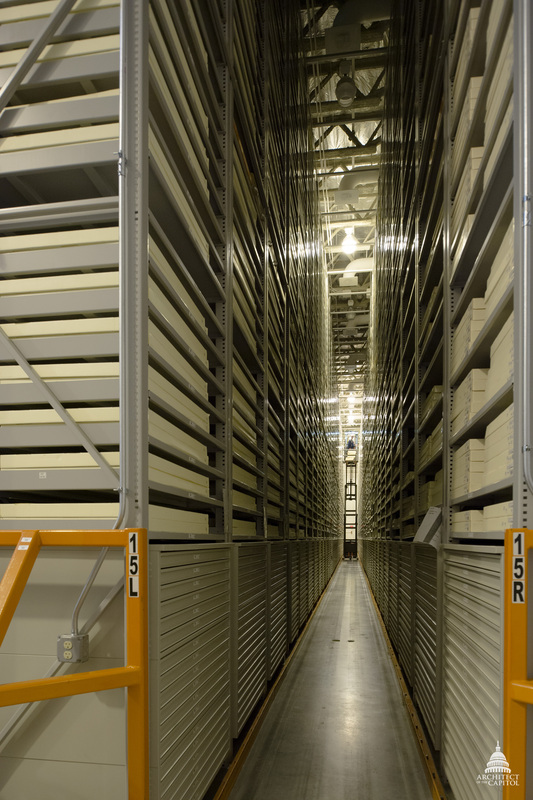 The Library of Congress stores a variety of items in its Book Storage Facility. As the Library of Congress collection grows, so does its need for more storage space since it receives approximately 250,000 new items every year. The Book Storage Facility currently consists of four book 'modules,' with planning for a fifth module underway and potential expansion to a total of 13 modules. The modules boast 35-foot high ceilings with rows of book shelves that reach 30 feet. Books, maps, globes, photographs, microfilm and music are stored in one of 10 different sized boxes and placed on one of six different sized shelves. There are three separate climates carefully maintained by the AOC — with temperatures set to 50, 35 and 25 degrees Fahrenheit — to accommodate the various items. Staging areas, set up outside of the chilly storage rooms, are used to allow items to acclimate to the varying temperatures and reduce condensation so they can be safely moved from one climate to another. The items are tracked through an automated book system that enables workers to quickly find and retrieve items. The process of "checking out" a book is a bit more involved given the distance the items have to travel from shelf to hand, but items are transported between Fort Meade and Capitol Hill every day. Requests for items come in from the Library of Congress and are retrieved at Fort Meade via a barcode that narrows down exactly which row, shelf and box house the particular item of interest. Given the height of the shelves, workers often have to use specialized lifts to retrieve items. A super-flat floor was installed to prevent the lifts from leaning and turning over, knocking over the thousands of carefully catalogued items. Magnets were also installed in certain spots in the floor, a few feet from the end of isles, to slow the lifts and prevent crashes. Every detail of the modules is centered on protecting history in its various forms and preserving it for generations to come. From Capitol Hill, the Supreme Court and Library of Congress to Fort Meade and other off-site facilities, the AOC's dedicated employees take pride in maintaining all facilities entrusted to their care and serving those that work to preserve all of the many historical treasures housed within them.